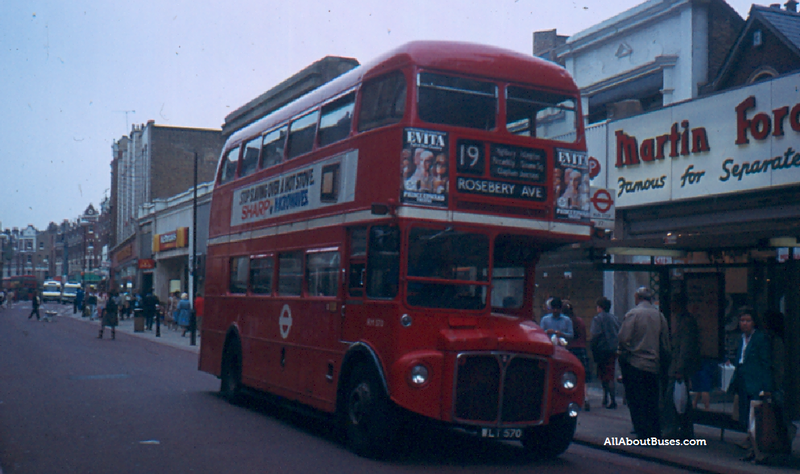 This week we jump back in time to 1984 in London . .
It’s summer 1984, back in the days when “the man on the Clapham omnibus” was more likely to be on the 19 than the 88! The cut-back of route 19 to Battersea Bridge a few years later always seemed a particularly retrograde step, with the route terminating in the middle of nowhere rather than serving the bustling commercial centre and massive railway interchange of Clapham Junction. Here we see RM570 at Clapham Junction, heading northbound (the next stop would be beside the railway station itself). This entry was posted in 1980s, London, Monday Morning Classic and tagged Clapham Junction, London Transport, Routemaster. Bookmark the permalink.